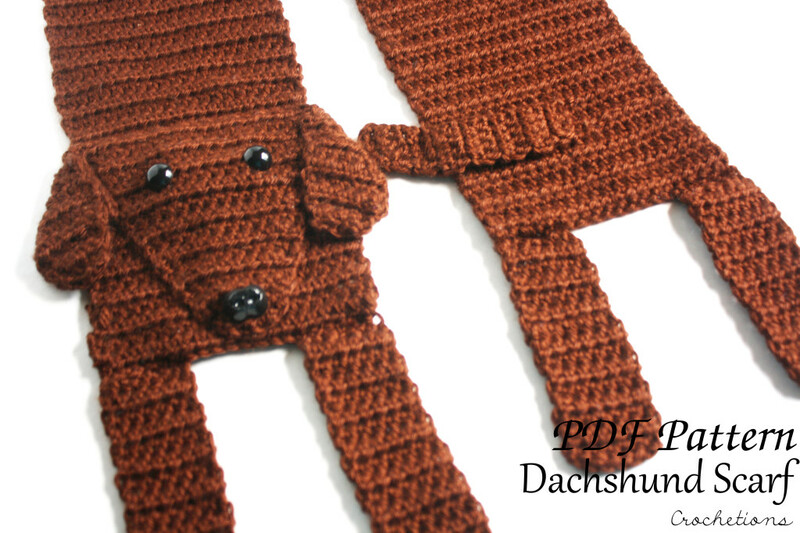 Crochet Pattern for the Dachshund Scarf. You can get this pattern from either Ravelry or Etsy! Click the button below to get it from that shop! This listing is for the PATTERN ONLY for the Dachshund Scarf. Not the finished product. This scarf was designed to resemble the popular and adorable dog breed, Dachshund. Surprise a friend or family member by making them a scarf that reminds them of their love for their dog! Or make it for yourself! Who wouldn’t love to share the love of their pet by wearing this scarf! *Pattern is written in standard US terms. *There is no shipping charge as this pattern is in PDF format. It will be delivered within 24 hours of payment. Contact me if it has not been received in that time. *Please do not photocopy, rewrite, resell or redistribute this pattern as your own or in any other form. This pattern is a product of my hard work and love for crochet. *You can sell any items you make from using my patterns. Or if you would like to purchase this scarf made by me, click HERE! Thank you for visiting and feel free to contact me if you need any help or have any questions about this pattern!